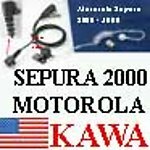 Offered here is ONE PIECE(1) new good quality aftermarket " Surveillance neck mic" with PTT Switch that works flawlessly with MOTOROLA FRS Radios as such Talkabout 200 & 250 , Talkabout Distance / DPS, Sport 7/7X and most other FRS radios with 2 pin plug configuration. When you hit the PTT button, the supersensitive "mic" picks up vibration around your neck, amplifies and converts it into signals suitable for transmission by your radio. Surrounding noise outside the ear will NOT be transmitted, ensuring that your buddy hears ONLY you. Mic comes with plug. The "collar mic" will conveniently fits all neck sizes and delivers great sound even in noisy places. A sponge ear cushion is provided to ensure comfortable fit. For hygiene purpose, click this icon if you want to buy more of the tube to share your mic with your buddies.